So excited to play The Grimm Forest! Gave the three-year-old his own account to play Mario Odyssey. Interesting to see how he interacts with it differently than the rest of the family. Nintendo news: They’re finally launching an online service. New mobile game coming soon: Mario Kart Tour. Working with Illumination Studios (Despicable Me, Secret Life of Pets) to make a Mario movie. Mini-painting tips. Magic The Gathering: Arena of the Planeswalkers, and Arcadia Quest are both good places to start. 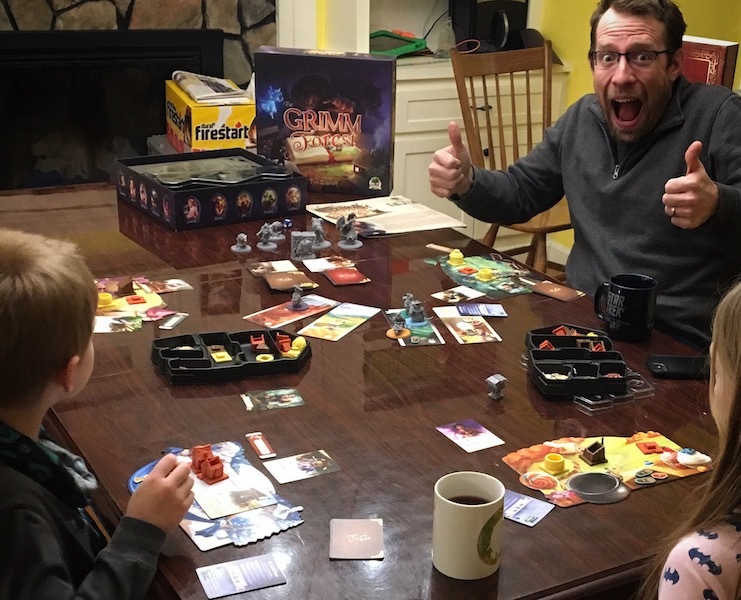 @bradsour recommended Dream Home to us, by Rebel & Asmodee. We’re going to check it out! Anitra wrote a guest post on MummyConfessions.com on board games to play with very young children. Andrew waxes poetic about Whole30. We both complain about added sugar in everything. Children know how to role-play naturally! But you, the adult, may need some help. We discuss different ways to approach role-playing, from no-prep (less structure) to lots of prep (and more structure). And of course, many adult-level systems exist for creating your own story: Dungeons & Dragons (we’ve heard great things about the current version “5th edition”), GURPS, Sentinels of the Multiverse RPG (a superhero universe coming soon from Greater Than Games), Paranoia, MouseGuard, Pathfinder, etc. We’re keeping our survey open for a few more weeks. (thefamilygamers.com/survey) It takes less than 5 minutes. Please fill it out and tell us what you think. You might even win a board game!